A few weeks ago, I got bored with watching my weekly shows, so I decided to hit the infamous backlog. After watching an entire show in a single day, I was re-enlightened to the glory of powering through completed shows, and decided to make an experience out of it - to watch as many feels-inducing shows as fast as possible. 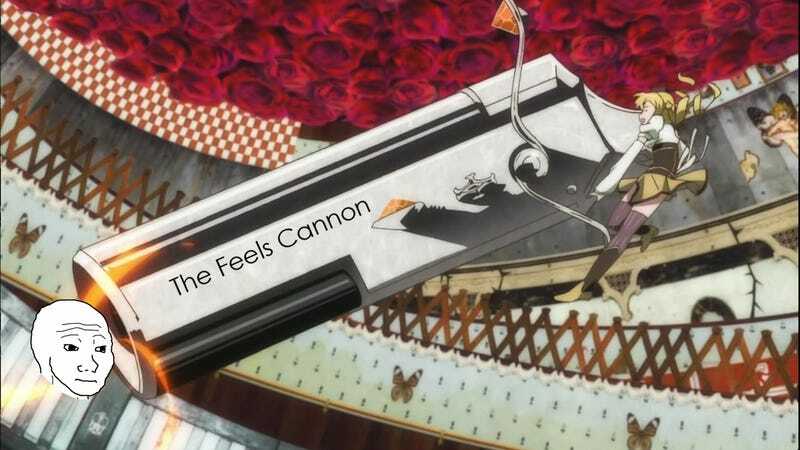 I’ve only hit a small portion of my full list of shows, which includes some good old classics and some new hits (all of which it is my first time to experience), so if you don’t see a feels show that you would recommend, go ahead and suggest it in a comment below. If I’ve seen it previously, I’ll still put it in the final part of the Feels Trip series in a category for “Other Recommended Feels.” I’m trying to stick to single cour shows simply for the ability to power through them in a day or two, but fear not, longer shows (ie Clannad and similar shows) will make the list later on when I have more free time. WARNING: There will be spoilers. Consider yourself sort-of-warned. What I got: For everything I had heard about how great Nozaki-kun was, I had never gotten around to watching it until I got this AMV stuck in my head and then decided to finally watch it. After one Friday afternoon/evening of nothing but marathoning it, I can confirm that this show is indeed awesome. It has a great sense of humor, a cast that is varied and large (but not so large as to be confusing or forgetful), and the parallels between Nozaki’s manga and his life are absolutely hilarious. Each episode had me laughing and wanting more (tanuki). I understood going into this show that the romance was by no means the main attraction, but I still wanted at least a little resolution at the very end, at least. If you are looking for a fun time that has some slight romance and don’t mind there never being any real resolution to said romance, this show is perfect for you. After all, it is a romantic comedy (emphasis on the comedy). If you’ve never seen Nozaki-kun before, or if you just enjoy/need a good laugh, I highly recommend it. It’s like a school romance that is aware of how ridiculous a lot of the general makings of school romances are - and beyond that, it delivers a consistently enjoyable experience in each episode. As I said before, the cast makes the show. The wide variety of characters and their various interactions, especially in regards to how they each relate to Nozaki’s manga, will continually put a smile on your face and make your day better. What I got: Regardless of the fact that this was recommended to me (by the infamous Proton) when I specifically asked for a show that had a real romantic resolution, I absolutely love this show and its ending. Non-ending/open-ended ending aside, it was satisfying nonetheless. This was an interesting show for me, particularly because I did not know that somewhere hiding inside of me is a petty 14 year old girl who would get angry every time Yuuri would do anything. As I watched this, Gugsy made a special request that I comment as I watched each episode in the AniTAY Chat (he had just watched it and wanted to see how I experienced it). Never before have I been so antagonizing to a character. Every time she would show up or say something or whatever, it would just annoy me to no end. I have no idea why this is, but it was an interesting experience. Aside from the Yuuri-hate, I actually enjoyed this show tremendously. The characters were great (yes, including Kou, he was my favorite) and even up to the very end, I wasn’t sure how the relationships would shake out. This was all possible due to Yuuri, even though I disliked her for her capability of ruining the pairing of Kou and Futaba. She was a good character, don’t get me wrong, and the scale of my reaction to her was probably the intent of the producers. It was interesting to see how each of the characters grew and changed throughout the series, as well as getting flashbacks to the childhood shared between Kou and Futaba. What I got: This was a show that was pretty ‘meh’ for me at the beginning and throughout most of the show. I understood why the characters would be feeling the way they were feeling, but I just didn’t feel it myself. It was all very good, but not hitting in the way I thought it would. Now, the last two episodes are an entirely different story. Once everybody is together and they all start being honest with each other it started to hit. Right in the feels. If you’re watching the show and wanting feels and not getting them - stick with it until the end. That scene and the last bit where, uh, [SPOILERS] happens and everybody cries made the wait worth it. Once you see the flower of notes under the tree, it’s about to take you on a journey to Feelsville and you’re going to love it. As far as the movie goes, I would say don’t bother watching it immediately after you’ve watched the series. It’s an hour and a half with only about an episode’s worth of new material in it. It’s perfect for those who saw the series a while ago and need a refresher, but the new material is scattered in between flashbacks and recaps of the events of the series. I ended up skipping the recap portions and just watching the new sections which were pretty good and added a lot of backstory about their childhoods. Honestly, I hope they cut all of the new material into an OVA at some point in the future. What I got: Look at those eyes. Just look at them. Those dead, cannibalistic, empty, inhuman eyes. They may look like evil incarnate at first glance, but really they are the eyes of a computer, cold and calculating, trying to save the universe from its inevitable heat death. There was a very interesting art style to the show, specifically the witches’ mazes, which I was not expecting. I thoroughly enjoyed the use of lighting and scenery to set the mood oftentimes, but I feel that despite all of the great components used to set up the big reveal in the penultimate and final episodes, the shock-and-awe factor was lost on me. I think it would have had a better effect had the series started off on a more upbeat, stereotypical magical girl “let’s defeat evil through friendship” note. Basically, a more exponential curve to the reveal of the trope/thematic inversions. Besides all of that, there were still moments that had me taken aback (usually accompanied by some annoyance with some of the characters and their actions), such as when it is revealed that Kyubey turns your soul into a little egg-shaped trinket. Or that Homura has Rintaro Okabe (Steins;Gate) levels of dedication. I liked Homura from almost the beginning and thought she was the best out of all the characters simply because she was logical, had a goal, and stuck to it - no nonsense, but man when you find out why she is that way... Or the ending where [SPOILER ALERT] Madoka is no longer a part of the world, but a ghost of her existence still lives on in people’s minds. I think the main reason that the series didn’t have a huge impact on me is one of two possibilities: 1) I am not the target audience who has only seen mahou shoujo and goes into this show thinking it will be more of the same or 2) People who automatically assume and predict the worst will already be expecting things to go south, therefore undercutting the impact of the reveals. I mean seriously though, if something seems too good to be true, it almost assuredly is. Especially when some weird cat/rabbit/thing uses telepathy to offer you anything you wish in exchange for you doing some physical labor. If your “this is sketchy” alarm isn’t going off or if you don’t even ask any clarifying questions of this total and complete stranger’s offer, you kinda brought the consequences upon yourself. As far as Rebellion goes, I see it as a continuation of Homura’s endless obsession with completely saving Madoka, and an eventuality that she would lose sight of what “saving” Madoka means. I don’t think it was terrible, nor great, but I do think it tried too hard to be existential. Parts of it were too much to ask from the viewer, and some parts I had to do some real mental gymnastics to make it fit right in my mind. I liked the film, but it felt too forced to really give any kind of “feels” for me personally (this may be effected by the fact that the series itself didn’t really give me any either). This has been the first rest stop along the journey of the Feels Trip, so make sure you buckle up, shout out where you want me to go next, and keep a lookout for the next part of this experience.